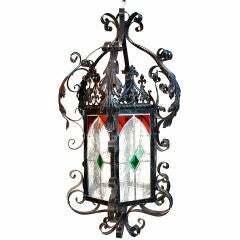 American Wrought Iron Hanging Lantern. Updated wiring. Candle fixture and original glass. Bent rattan hanging light. Vintage. Two made to order heavy metal side tables. Painted brown tops and black legs. Priced and sold individually. Ebonized wood top. Distressed white paint on metal base. Original polychrome painted designs. No nails used, all wooden pegs. 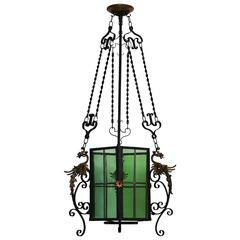 American wrought iron and stained glass three light hanging lantern. Originally candle powered. Dealers please call for trade price. 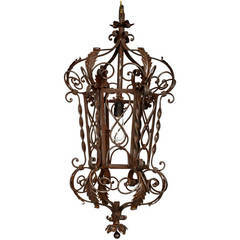 Awesome French lantern decorated with brass dragons. 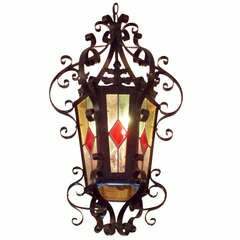 Wrought iron mount with nice colored stained glass. Measures: Diameter 55 cm, total height 117 cm, height fixture 35 cm. 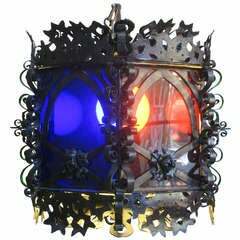 Large and decorative hexagonal lantern with a wrought-iron structure and panes of coloured glass (red, blue &amp; green). 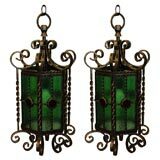 Beautifully handmade wrought iron workmanship. Can be used exterior or interior. 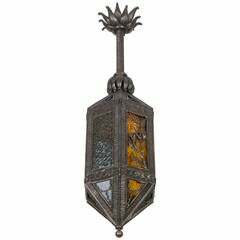 Stunning as an entry lighting.